Virtualization presents challenges and opportunities for backup. One challenge is that backup systems have to protect data from virtual machines as well as physical ones. In some cases, IT was forced to host two solutions here, one backup tool for physical and a separate product to backup virtual machines. BluPointe has no such problem. BluPointe can back up physical servers and workstations, but can also protect virtual machines such as those from VMware 4.0, 4.1, 5.0 and later versions, and can make a hot-backup of an already running VMware virtual machine. When it comes time to restore, BluPointe can reinstall the VM-image and related snapshots to either the original VMware host, or to a new host. For smaller incidents, BluPointe can restore a single file from a VMware image. This technology can form the basis of a Virtual Disaster Recovery (VDR) service, where service providers can create offerings that let IT recover from data loss in minutes from the cloud. Here a failed Windows Server can now be recovered to VMware or a VMDK. BluPointe also supports the fast-rising Microsoft Hyper-V hypervisor. 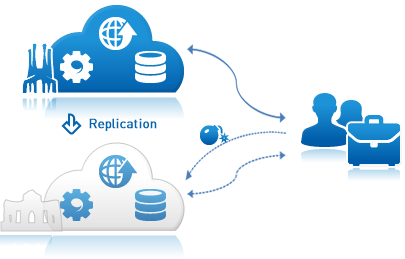 Here BluPointe can back up virtual machines based on Hyper-V Cluster Shared Volumes (CSV).